Members of US Congress said Sunday they want to know more details about the FBI investigation that revealed an extramarital affair between ex-CIA Director David Petraeus and Paula Broadwell, questioning when the retired general popped up in the FBI inquiry, whether national security was compromised and why they weren’t told sooner. The FBI was investigating harassing emails sent by David Petraeus biographer and girlfriend Paula Broadwell to a second woman. That probe of Paula Broadwell’s emails revealed the affair between her and David Petraeus. The FBI contacted David Petraeus and other intelligence officials, and Director of National Intelligence James Clapper asked Petraeus to resign. A senior U.S. military official identified the second woman as Jill Kelley, 37, who lives in Tampa, Florida, and serves as a social liaison to the military’s Joint Special Operations Command. The U.S. official said the coalition countries represented at the military’s Central Command in Tampa gave Jill Kelley an appreciation certificate on which she was referred to as an “honorary ambassador” to the coalition, but she has no official status. The official, speaking on condition of anonymity because he wasn’t authorized to discuss the case publicly, said Jill Kelley is known to drop the “honorary” part and refer to herself as an ambassador. The military official, who spoke on condition of anonymity because he was not authorized to publicly discuss the investigation, said Jill Kelley had received harassing emails from Paula Broadwell, which led the FBI to examine her email account and eventually discover her relationship with David Petraeus. A former associate of David Petraeus confirmed the target of the emails was Jill Kelley, but said there was no affair between the two, speaking on condition of anonymity to discuss the retired general’s private life. The associate, who has been in touch with David Petraeus since his resignation, says Jill Kelley and her husband were longtime friends of Petraeus and wife, Holly. David Petraeus resigned while lawmakers still had questions about the September 11 attack on the U.S. Consulate and CIA base in Benghazi, Libya, that killed four Americans, including U.S. Ambassador Chris Stevens. Lawmakers said it’s possible that David Petraeus will still be asked to appear on Capitol Hill to testify about what he knew about the U.S. response to that incident. “It seems this [the investigation] has been going on for several months and, yet, now it appears that they’re saying that the FBI didn’t realize until Election Day that General Petraeus was involved. It just doesn’t add up,” said Peter King, R-N.Y.
David Petraeus, 60, quit Friday after acknowledging an extramarital relationship. 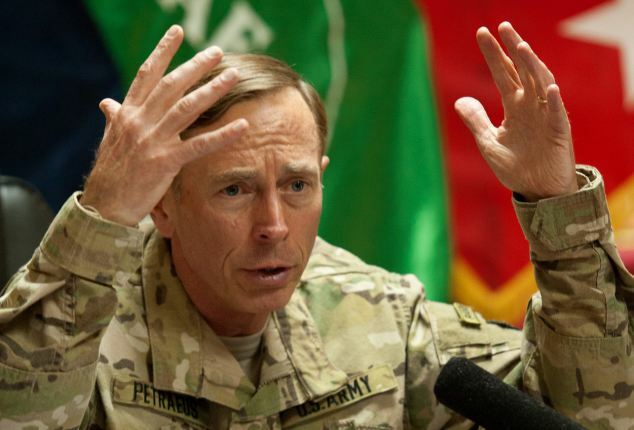 He has been married 38 years to Holly Petraeus, with whom he has two adult children, including a son who led an infantry platoon in Afghanistan as an Army lieutenant. Paula Broadwell, a 40-year-old graduate of the U.S. Military Academy and an Army Reserve officer, is married with two young sons. David Petraeus’ affair with Paula Broadwell will be the subject of meetings Wednesday involving congressional intelligence committee leaders, FBI deputy director Sean Joyce and CIA deputy director Michael Morell. David Petraeus had been scheduled to appear before the committees on Thursday to testify on what the CIA knew and what the agency told the White House before, during and after the attack in Benghazi. Republicans and some Democrats have questioned the U.S. response and protection of diplomats stationed overseas. Michael Morell was expected to testify in place of David Petraeus, and lawmakers said he should have the answers to their questions. But Dianne Feinstein and others didn’t rule out the possibility that Congress will compel David Petraeus to testify about Benghazi at a later date, even though he’s relinquished his job. “I don’t see how in the world you can find out what happened in Benghazi before, during and after the attack if General Petraeus doesn’t testify,” said Sen. Lindsey Graham, R-S.C.
Lindsey Graham, a member of the Senate Armed Services Committee, wants to create a joint congressional committee to investigate the U.S. response to that attack. Dianne Feinstein said she first learned of David Petraeus’ affair from the media late last week, and confirmed it in a phone call Friday with Petraeus. She eventually was briefed by the FBI and said so far there was no indication that national security was breached. Still, Dianne Feinstein called the news “a heartbreak” for her personally and U.S. intelligence operations, and said she didn’t understand why the FBI didn’t give her a heads up as soon as David Petraeus’ name emerged in the investigation. “We are very much able to keep things in a classified setting,” she said. Jason Clapper was told by the Justice Department of the Petraeus investigation at about 5 p.m. on Election Day, and then called David Petraeus and urged him to resign, according to a senior U.S. intelligence official who spoke on condition of anonymity because he was not authorized to discuss the investigation publicly. FBI officials say the committees weren’t informed until Friday, one official said, because the matter started as a criminal investigation into harassing emails sent by Paula Broadwell to another woman. Concerned that the emails he exchanged with Paula Broadwell raised the possibility of a security breach, the FBI brought the matter up with David Petraeus directly, according to the official, who spoke on condition of anonymity because he was not authorized to publicly discuss the investigation. David Petraeus decided to quit, though he was breaking no laws by having an affair, officials said. Dianne Feinstein said she has not been told the precise relationship between David Petraeus and the woman who reported the harassing emails to the FBI. Georgia Sen. Saxby Chambliss, the top Republican on the Senate intelligence committee, called David Petraeus “a great leader” who did right by stepping down and still deserves the nation’s gratitude. He also didn’t rule out calling David Petraeus to testify on Benghazi at some point. “He’s trying to put his life back together right now and that’s what he needs to focus on,” Saxby Chambliss said.